Blepharoplasty is a cosmetic surgical procedure that removes fat deposits, excess tissue, or muscle from the eyelids to improve the appearance of the eyes. The primary use of blepharoplasty is for improving the cosmetic appearance of the eyes. In some older persons, however, sagging and excess skin surrounding the eyes can be so extensive that it limits the range of vision. In those cases, blepharoplasty serves a more functional purpose. Approximately 100,000 blepharoplasty procedures are performed each year in the United States. The procedure is more common among women than men. Blepharoplasty can be performed on the upper or lower eyelid. It can involve the removal of excess skin and fat deposits and the tightening of selected muscles surrounding the eyelids. The goal is to provide a more youthful appearance and/or improve eyesight. The surgeon will begin by deciding whether excess skin, fat deposits, or muscle looseness are at fault. While a person is sitting upright, the surgeon will mark where incisions will be made on the skin. Care will be taken to hide the incision lines in the natural skin folds above and below the eye. The surgeon will then inject a local anesthetic to numb the pain. Many surgeons also administer a sedative intravenously during the procedure. pockets of fat that have collected in the lids. If muscle looseness is also a problem, the surgeon may trim tissue or add a stitch to pull muscle tissue tighter. Then the incision is closed with stitches. In some persons, fat deposits in the lower eyelid may be the only or primary problem. Such people may be good candidates for transconjunctival blepharoplasty. In this procedure the surgeon makes no incision on the surface of the eyelid, but instead enters from behind, through the inner surface of the lid, to tease out the fat deposits from a small incision. The advantage of this procedure is that there is no visible scar. Before performing blepharoplasty, the surgeon will assess whether a person is a good candidate for the treatment. A thorough medical history is important. The surgeon will want to know about any history of thyroid disease, hypertension, or eye problems, which may increase the risk of complications. Prior to surgery, surgeons and their candidates meet to discuss the procedure, clarify the results that can be achieved, and discuss potential problems that might occur. Having realistic expectations is important in any cosmetic procedure. People will learn, for example, that although blepharoplasty can improve the appearance of the eyelid, other procedures, such as a chemical peel, will be necessary to reduce the appearance of wrinkles around the eye. Some surgeons prescribe vitamin C and vitamin K for 10 days prior to surgery in the belief that this helps the healing process. Candidates are also told to stop smoking in the weeks before and after the procedure, and to refrain from using alcohol or aspirin . An antibiotic ointment is applied to the line of stitches each day for several days after surgery. Patients also take an antibiotic several times a day to prevent infection. Ice-cold compresses are applied to the eyes continuously for the first day following surgery, and several times a day for the next week or so, to reduce swelling. Some swelling and discoloration around the eyes is expected with the procedure. Persons should avoid aspirin or alcoholic beverages for one week and should limit their activities, including bending, straining, and lifting. The stitches are removed a few days after surgery. People can generally return to their usual activities within a week to 10 days. As with any surgical procedure, blepharoplasty can lead to infection and scarring. Good care of the wound following surgery can minimize these risks. In cases where too much skin is removed from the eyelids, people may experience difficulty closing their eyes. Dry eye syndrome may develop, requiring the use of artificial tears to lubricate the eye. In a rare complication, called retrobulbar hematoma, a pocket of blood forms behind the eyeball. Most people can expect good results from blepharoplasty, with the removal of excess eyelid skin and fat producing a more youthful appearance. Some swelling and discoloration is expected immediately following the procedure, but this clears in time. Small scars will be left where the surgeon has made incisions; but these generally lighten in appearance over several months, and, if placed correctly, will not be readily noticeable. If too much excess skin is removed from the upper eyelid, persons may be unable to close their eyes completely. Another surgery to correct the defect may be required. Similarly, too much skin can be removed from the lower eyelid, allowing too much of the white of the eye (the sclera) to show. In extreme cases, the lower lid may be pulled down too far, revealing the underlying tissue. This is called an ectropion and may require a second, corrective surgery. The eye's ability to make tears may also be compromised, leading to dry eye syndrome. Dry eye syndrome is potentially dangerous; in rare cases it leads to damage to the cornea of the eye and vision loss. Some of the alternatives to blepharoplasty include losing some excess body fat, exercise , accepting one's body and appearance as it is, or using makeup to downplay or emphasize facial features. See also Face lift ; Liposuction . Engler, Alan M. BodySculpture: Plastic Surgery of the Body for Men and Women. 2nd ed. Hudson Pub, 2000. Irwin, Brandith, and Mark McPherson. Your Best Face: Looking Your Best without Plastic Surgery. Carlsbad, CA: Hay House, Inc, 2002. Man, Daniel, and L. C. Faye. New Art of Man: Faces of Plastic Surgery: Your Guide to the Latest Cosmetic Surgery Procedures. 3rd ed. New York: BeautyArt Press, 2003. Papel, I. D., and S. S. Park. Facial Plastic and Reconstructive Surgery. 2nd ed. New York: Thieme Medical Publishers, 2000. Byrd, H. S., and J. D. Burt. "Achieving Aesthetic Balance in the Brow, Eyelids, and Midface." Plastic and Reconstructive Surgery 110 (2002): 926–939. Cather, J. C., and A. Menter. "Update on Botulinum Toxin for Facial Aesthetics." Dermatology Clinics of North America 20 (2002): 749–761. Oliva, M. S., A. J. Ahmadi, R. Mudumbai, J. L. Hargiss, and B. S. Sires. "Transient Impaired Vision, External Ophthalmoplegia, and Internal Ophthalmoplegia after Blepharoplasty under Local Anesthesia." American Journal of Ophthalmology 135 (2003): 410–412. Yaremchuk, M. J. "Restoring Palpebral Fissure Shape after Previous Lower Blepharoplasty." Plastic and Reconstructive Surgery 111 (2003): 441–450. American Academy of Facial Plastic and Reconstructive Surgery. 310 S. Henry Street, Alexandria, VA 22314. Telephone: (703) 299-9291, Fax: (703) 299-8898. http://www.facial-plastic-surgery.org . American Board of Plastic Surgery. Seven Penn Center, Suite 400, 1635 Market Street, Philadelphia, PA 19103-2204. (215) 587-9322. http://www.abplsurg.org . American College of Plastic and Reconstructive Surgery. http://www.breast-implant.org . American College of Surgeons. 633 North Saint Claire Street, Chicago, IL, 60611. (312) 202-5000. http://www.facs.org . American Society for Aesthetic Plastic Surgery. 11081 Winners Circle, Los Alamitos, CA 90720. (800) 364-2147 or (562) 799-2356. http://www.surgery.org . American Society for Dermatologic Surgery. 930 N. Meacham Road, P.O. Box 4014, Schaumburg, IL 60168-4014. (847) 330-9830. http://www.asds-net.org . American Society of Plastic and Reconstructive Surgeons. 44 E. Algonquin Rd., Arlington Heights, IL 60005. (847) 228-9900. http://www.plasticsurgery.org . American Society of Plastic Surgeons. 444 E. Algonquin Rd., Arlington Heights, IL 60005. (888) 475-2784. http://www.plasticsurgery.org . "Blepharoplasty." American Society of Ophthalmic Plastic and Reconstructive Surgery. [cited April 2003]. http://www.asoprs.org/blepharoplasty.html . "Blepharoplasy." Facial Plastic Surgery Network. [cited March 2003]. http://www.facialplasticsurgery.net/blepharoplasty.htm . 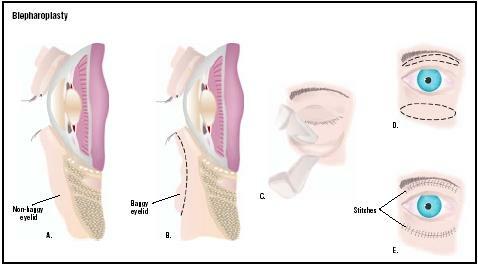 "Eyelid Surgery (Blepharoplasty)." Department of Otolaryngology/Head and Neck Surgery at Columbia University and New York Presbyterian Hospital. 2002 [cited April 2003]. http://www.entcolumbia.org/bleph.htm . Galli, Suzanne K. Doud, and Phillip J. Miller. "Blepharoplasty, Transconjunctival Approach." emedicine. September 11, 2001 [cited April 2003]. http://www.emedicine.com/ent/topic95.htm . Blepharoplasty procedures are performed by surgeons with specialized training in plastic and reconstructive surgery. They are most commonly performed in outpatient facilities or in private professional offices. The procedure may also be performed in a hospital. In 2003, the average price of blepharoplasty for both upper lids was approximately $4,000. For both lower lids, the cost may be slightly higher. The cost for both upper and lower blepharoplasty was approximately $6,000. These prices usually include anesthesia and surgeon fees. Medications and lab work, as well as any revisionary work, are not included. What will be the resulting appearance? Is the surgeon board certified in plastic and reconstructive surgery? How many blepharoplasty procedures has the surgeon performed? What is the surgeon's complication rate? One further alternative is a "Non Surgical Blepharoplasty" procedure, which involves the injection of filler material (Juvederm or Restylane) into the tear trough area under the lower eyelid. This is a procedure to replace volume lost with time under the lower lid. It is designed to correct dark circles or hollows under the eyes. Non Surgical Blepharoplasty is not a procedure that can correct "eye bags" (pouching of the lower eyelid due to herniating fat) and it will not correct "crepey" skin (fine lines etched into the lower eyelid skin). It is, however, a good alternative to surgery when volume loss is the only issue. Hyaluronic acid fillers like Restylane or Juvederm only should be used. Duration of effect is about 18 months. There is no downtime and minima risk involved - the main danger is bruising in the area of injection. Practitioners performing this procedure must be familiar and comfortable with the use of Hyaluronidase - an enzyme that dissolves hyaluronic acid. Post procedure swelling and irregular contour is very common, but is easily corrected with the enzyme. Hiya, I’m really glad I’ve found this information. A good information with exciting content, that’s what I need. Thank you for keeping this web-site, I’ll be visiting it. Do you do newsletters? Cant find it. It's been 3 weeks since I've had the fatty deposits removed from beneath both eyes. Is it a problems that I still have some swelling, discoloration, and the stitches haven't totally disappeared?